When we visit a new place, we’re just as excited (sometimes moreso) to try new food as we are to see the sites. And when that food includes cheeses, pastries, desserts, and other local specialties, we know it’s going to be a great trip. That’s why I spent one of my days in Athens exploring the streets and treats on an Athens food tour. I spent over four hours discovering some of the coolest spots in the city and trying some of the best food available in Athens on the aptly-named Athens for Foodies tour. Not only did I eat a lot, but I left with a better understanding of Athens and its food traditions. 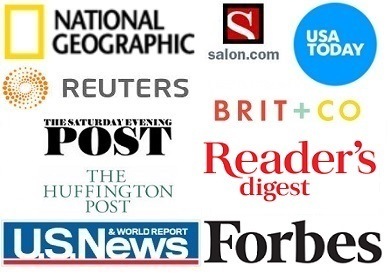 Here are six of the things I learned along the way. Koulouri is just about the simplest thing you could have for breakfast. 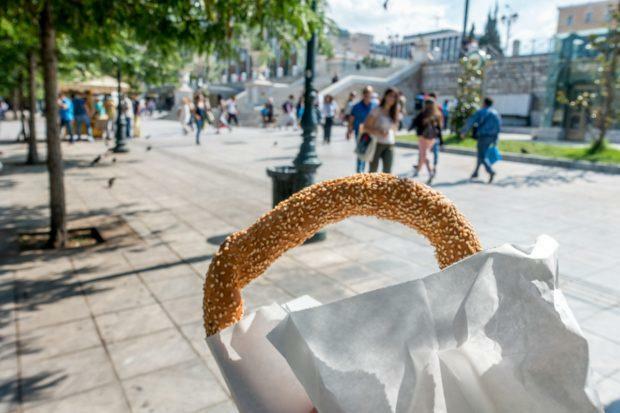 Just like thousands of Athenians do every day, we started our day with this sesame seed-coated pastry. Koulouri has just five ingredients—flour, yeast, water, salt, and sugar. While it doesn’t sound revolutionary, there’s something about the combination of the crunchy outside and the soft center that makes the koulouri absolutely perfect. We got our koulouri from a vendor in the heart of the city at Syntagma Square. There are plenty of kiosks and street food stands to buy from, but there’s little point to shopping around—one central bakery makes 10,000 koulouri every day, so many spots sell exactly the same product. Nearly 3000 years ago, victors in the ancient Olympics didn’t pose with golds, silvers, and bronzes. Instead, they chowed down on one of the best treats I’ve tried in a long time—loukoumades. These fluffy delights were given to the winners along with an olive branch wreath, of course. 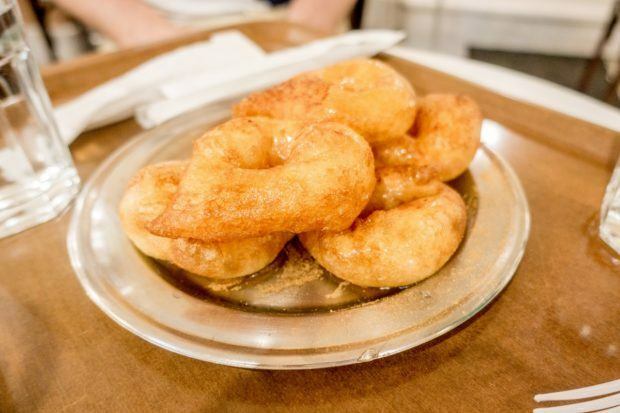 Covered in honey and dusted with cinnamon, the pastries are similar to a beignet—less dense than a donut and with a crunch on the outside. Today, you don’t have to win a discus competition or outrun your opponent to indulge in loukoumades. In fact, they’re practically a staple food in Athens, Greece. The traditional pastry shop where we stopped was filled with groups of people each indulging in a plate, and that’s no small feat since they come in orders of six! Greek cuisine is known for its grilled meats, fresh seafood, and fabulous cheeses, but there’s also a large selection of vegan dishes thanks to Greek Orthodox tradition. Ladera dishes are vegetable-based and cooked in Greek olive oil. They often feature staples like tomatoes, garlic, herbs, and spices. On our tour, we got to try spanakorizo, a flavorful spinach and rice dish that was one of my favorites of the day. Even better? We tried it at a restaurant in the middle of the Athens Central Market. OK, so this one’s not about food, but the Athens for Foodies tour goes well beyond food, taking you to places in the city you might not see otherwise. While the Acropolis is at the top of every list of ancient sites to see in Athens, there are plenty of others to visit, some in unusual places. In the middle of the high-traffic shopping area of Ermou Street, our tour took us past the Church of Panagia Kapnikarea. 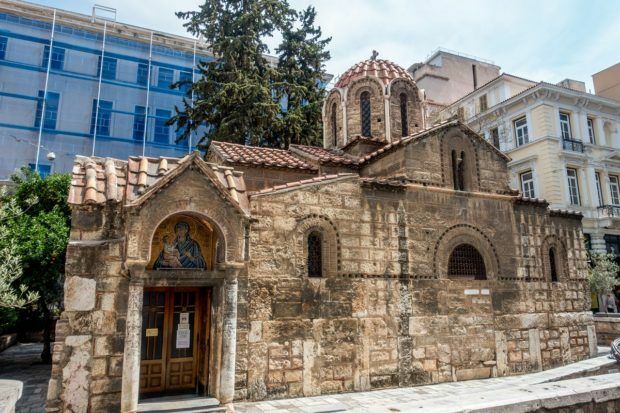 Built in 1050, the Byzantine church is one of the oldest in Athens and is built on the ruins of a pagan temple. A century ago, it was nearly demolished, but it survived and now stands among the much taller and newer landscape of downtown Athens. 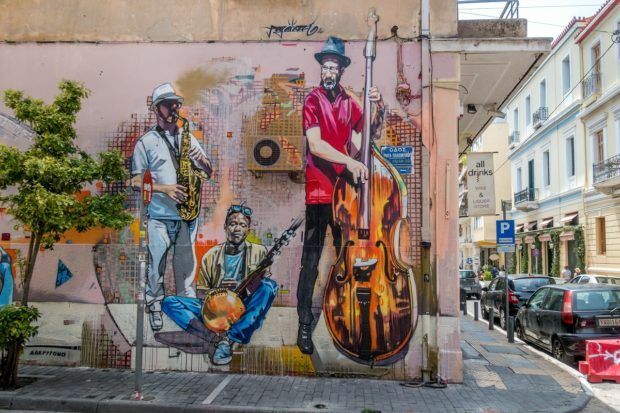 On the other end of the historic spectrum is the street art neighborhood of Psyri. For block after block, all available spaces from walls to mailboxes seem to be covered with brilliant art. I would never have seen it without the Greeking.me tour. 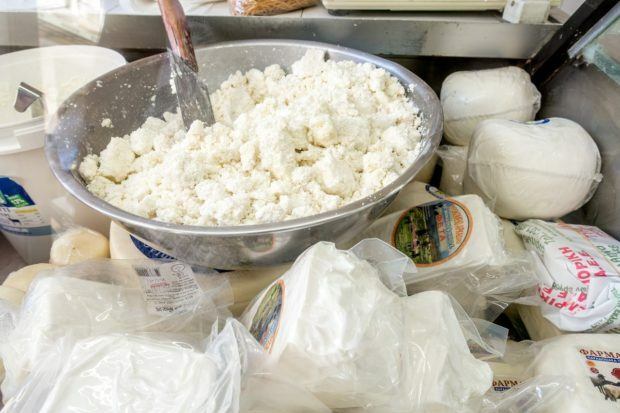 Even if you know nothing about food in Greece, you probably know about the salty, crumbly goodness that is feta cheese. But Greeks’ love for cheese goes way beyond feta, too. In fact, the average Greek eats over 75 pounds of cheese a year. Three of the top choices were on the sampling menu for our Athens food tour—feta (of course), anthotiro, and graviera. Anthotiro is a traditional soft cheese made from sheep’s and goat’s milk, and it’s perfectly sweet and creamy. Graviera (which we later had at pretty much every meal during our trip to Crete) is the second most popular cheese in Greece. It’s a hard cheese made from sheep’s and/or cow’s milk depending on where it’s produced. It can be served cold as a snack, fried as “saganaki” cheese, or baked in a casserole. All of them were delicious options. Thanks to political turmoil in the early 1920s, an influx of about one million Greek refugees fled Asia Minor (now Turkey) bound for Greece. Their arrival forever changed the Greek culinary scene because they brought something with them that, interestingly, wasn’t already part of the Greek diet—spices. 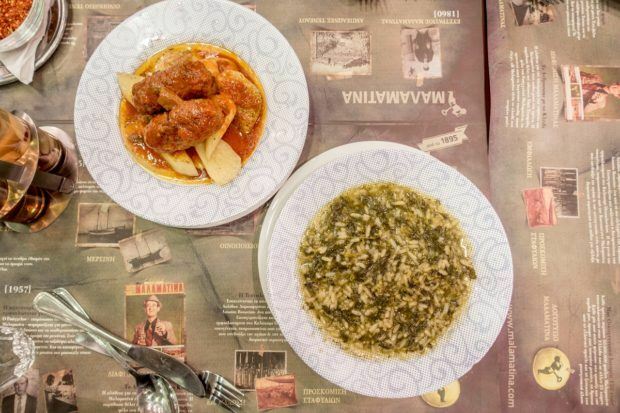 They’re responsible for the wonderful stuffed vine leaves, filling moussaka, cumin-spiced meatballs and sausages, and other items that are now staples of every Greek menu. On our food tour, we stopped at Miran, a popular charcuterie store run by a family who brought their traditions with them when they left Cappadocia. 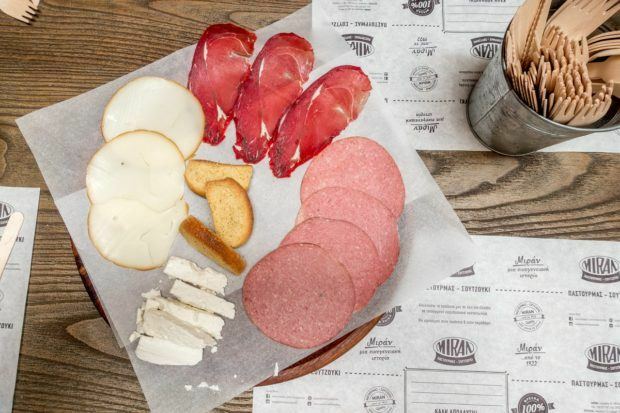 Their specialty pastrami and salami are crusted with traditional spices like fenugreek, chili, and cumin and are cured and aged in the same way the family has done for the last 90 years. Food like this is now such an integral part of Greek culture that it’s nearly impossible to remember before it existed. 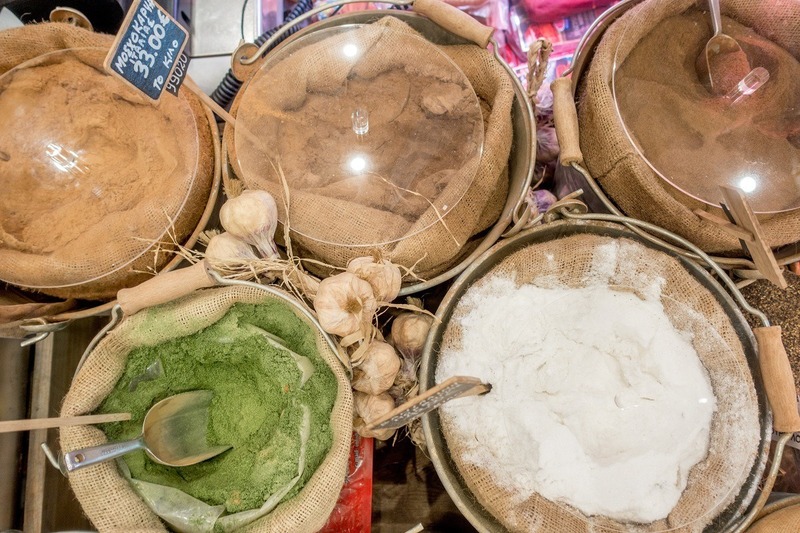 What do you think about Six Things I Learned on an Athens Food Tour? Mmm I love Greek food. 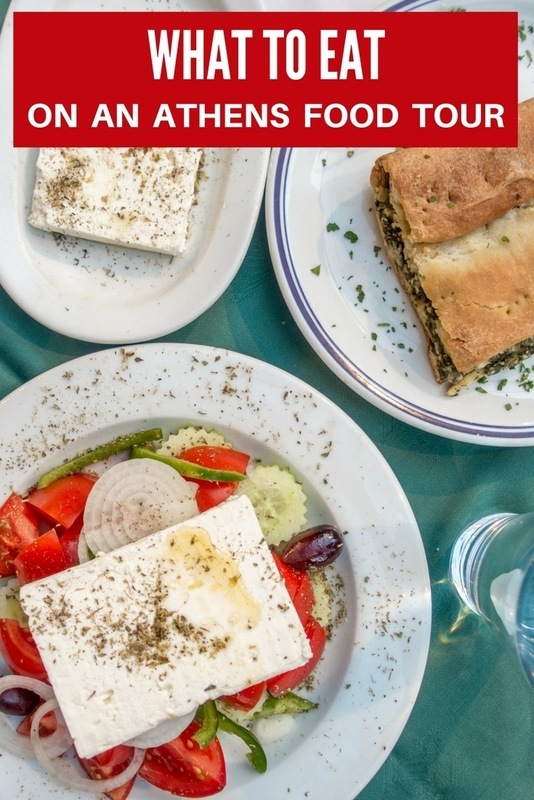 I went on a food tour in Thessaloniki and even though Athens and Thessaloniki are both on the Greek mainland the traditions are really different, how interesting. I guess Thessaloniki being Turkish for a while and having 70% jeweish population caused that. And yes to the cheese thing. I don’t eat cheese and that made a lot of jaws drop, haha!! 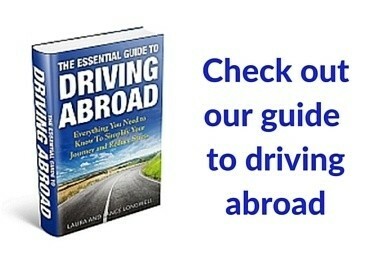 So interesting–I didn’t know that about Thessaloniki. Will have to add that to our list for next time!